Mother Mindy Valentine Davis has been a member of the Episcopal Church since she was 10 years old. As a young child, she would attend monthly deaf services at St. Matthew’s-by-the-Bridge Episcopal Church in Iowa Falls, Iowa with her deaf great-grandmother and family. She grew up in the town of Waterloo, Iowa and was a member of Trinity Episcopal Church in that town. Mother Mindy served in several capacities in that church, including adult and children formation, choir member, vestry member, lay reader, and lay Eucharistic minister. Trinity was her sending parish when she received the call to the priesthood. 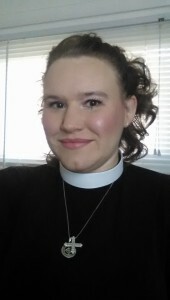 Mother Mindy attended seminary at Sewanee, The University of the South, School of Theology in Sewanee, Tennessee, and graduated with her MDIV in May of 2016. While in seminary, she was involved in Taize’ worship, choir, and chant. Mother Mindy served at The Episcopal Church of the Redeemer in Shelbyville, TN for her field education. As part of her faith and community organizing education, she attended The Children’s Defense Fund Proctor Institute at the Alex Haley Farm and volunteered her time for the Direct Action Research and Training Center (DART) helping to build a faith-based community justice organization in Knoxville, Tennessee, now known as Justice Knox. Mother Mindy was ordained to the priesthood on the Feast of the Transfiguration 2016 by Alan Scarfe, Bishop of Iowa. She was hired as priest-in-charge at St. James Episcopal in West Bend, Wisconsin and started there at the end of August of 2016. Mother Mindy is now canonically resident in the Diocese of Milwaukee. Mother Mindy has a head for math and figures. In high school, she did some work as a math tutor. She had a dual major of Russian and Mathematics at the University of Iowa. Upon her transfer to the University of Northern Iowa, she dropped the math major to focus on Russian, but still has a love for logic and figuring out problems, mathematical or otherwise. Her hobbies include reading, singing, karaoke, spending time with friends and family, and general geeky and nerdy television shows and movies.